In INGENIA OUR PRIORITY IS TO HELP YOU. Our team is integrated by specialists, engineers and lawyers with wide experience in brands, patents and copyrights. WHAT are the characteristics of industrial property rights? Exclusiveness: The holder is the only authorized to commercially exploit what he has protected. Territoriality: The rights granted within the national territory, independent of other countries. Temporality: Stipulated time during which what has been commercially protected can be exploited. Source: Industrial property in Mexico. Ministry of Economy. Contact us to receive a free consultation from our experts. 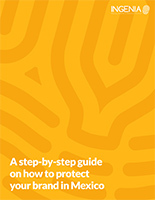 “A step-by-step guide on how to protect your brand in Mexico”. Enter a name and email to continue the download.